Just like a fine wine or vintage muscle car you can be a Classic in these Birthday Personalized T-Shirts proudly displaying your treasured birth year. Our Birthday Personalized Shirt is available on our premium white 100% cotton Personalized T-Shirt, machine washable in adult sizes S-3XL. Also available in Ash Gray. Includes FREE Personalization! 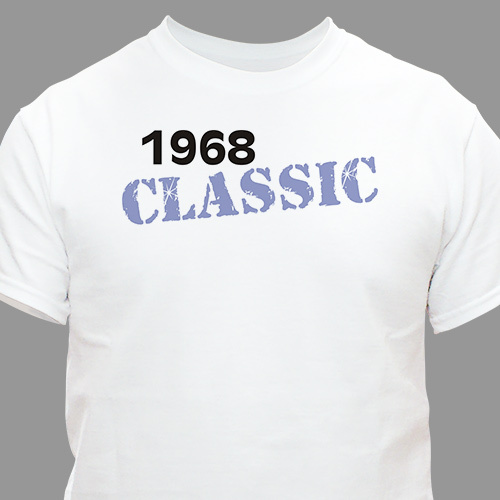 Personalize your Classic Birthday T-Shirt with any year. This was exactly what I wanted. For this order I wanted something more subtle. Your variety is outstanding. GiftsForYouNow.com has a large variety of Personalized Birthday Gifts for your Dad, Grandpa or Brother. Create something special just for them for their birthday.